I have a nurse who is my same age and she is 35 weeks pregnant. She shared with me the other night that she lost her mom unexpectantly when she was 18 weeks. I didn't even know how to respond to that. I can't imagine what it must be like to loose someone so dear to you so unexpectantly. Actually, I can't imagine what it must be like to loose someone so dear to you expectantly. I have been very fortunate in my life and have not lost anyone except for my grandparents and elderly aunts/uncles. When I think about my nurse, my heart goes out to her and my situation seems so trivial. All I have been asked to do is lie on my back for a few months. As I lay in the bed the other night, I once again was reminded that life is so short and so mysterious. 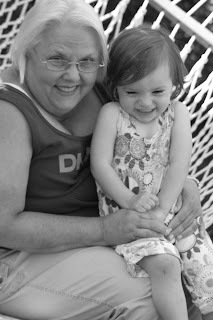 I can't fathom my life without my mom and my daughter's life without her "mimi". She enriches our lives. So, I'd like to tell her that in case I haven't done so lately. We love you, Mom, and we pray you will continue to enrich our lives for years to come. I can't wait for you to meet your new granddaughter!